Civil society-supported protests rocked the country on Friday against citizens being allegedly forced to get services through aadhaar. Protesters especially took strong exception to the government's notifications making aadhaar mandatory for essential services, including scholarships, school lunches, and disability stipends. Led by a call for action by the Right to Food Campaign, several NGOs and people's movements, including Right to Food Campaign India, Delhi Rozi Roti Adhikar Abhiyan, Right to Food Campaign Karnataka, NirAadhaar Collective, People’s Union for Civil Liberties (PUCL) and Rethink Aadhaar, organized events in different districts towns and cities of India. In Jaipur, PUCL organised a discussion, which was attended by students, researchers and activists. Arjun Sheoran, advocate, the Punjab and Haryana High Court, told the audience how aadhaar was being made a tool of "tracking and surveillance in a democratic society”. According to him, at the Central Monitoring System (CMS), the mass surveillance tool was being used to intrude one’s privacy on internet, phone and electronic data. “From a completely voluntary programme, aadhaar is being made all pervasive, without any need for the same, for midday meals, bank accounts, PAN cards, aid to victims of manual scavenging, prostitution bonded Labour, SIM cards etc”, he said. 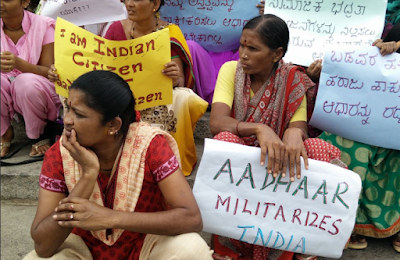 In Karnataka, the Right to Food Campaign organized simultaneous events across 14 districts, with groups of citizens protested against aadhaar at local offices. 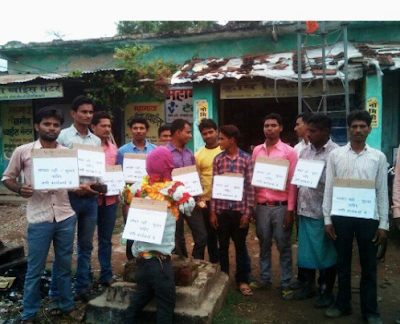 They submitted memorandums to district collectors demanding that aadhaar should not be made mandatory for the National Rural Employment Guarantee Scheme jobs, public distribution system, pension and other government schemes. A memorandum was prepared and submitted to the Karnataka Chief Minister. In Bangalore, several social organizations – Right to Food Campaign, Karnataka, Slum Jan, Andolana, Milana, and PUCL – came together to protest against aadhaar at the Town Hall. Those who addressed included Prabhakar, Karnataka slum activist; Prof Kshithij Urs, National Law Schoo; Meenamma and Narasimha from the Slum Jan Andolana; Ron Abraham, social activist and entrepreneur; and Vishwanath from the New Socialist Alternative. “The Supreme Court which has a duty to question impunity of the Government of India is instead trying to find a rationale for its implementation", it was alleged. In Delhi, students, researchers and activists organized a signature campaign and recorded citizens' grievances at the Universal Identity Authority of India (UIDAI) regional office at Pragati Maidan. 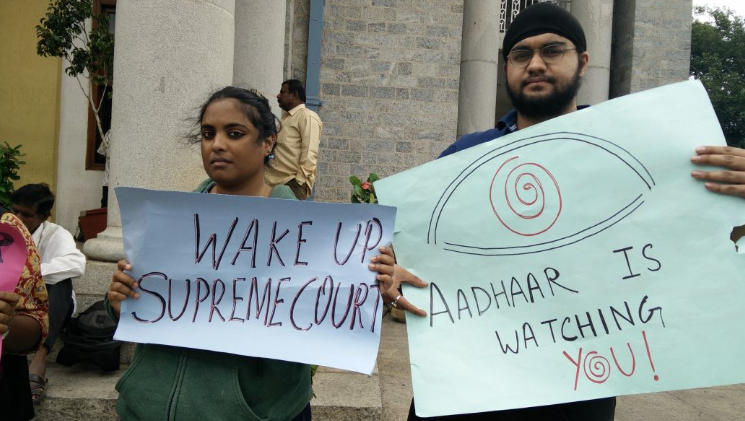 People had queued up at the office from early morning 5 am, pointing towards the costs and harassment they faced in enrolling for and updating aadhaar or else they would be cut from existing services. Sushil Singh,62, who was making his third trip to UIDAI office this week, said that he cannot apply for his pension because his name is erroneously spelt on his aadhaar card. Bhagwan Singh, a construction worker from Nangol,i was there a second time as his aadhaar card did not have his birth date but only birth year. Om Prakash, a pensioner was there because his aadhaar card was mysteriously cancelled without any prior notice or hearing granted. 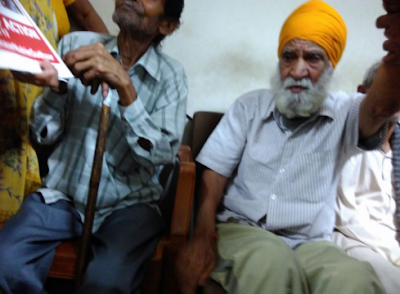 Joginder Singh, another pensioner who is visually challenged, said he was rejected during biometric authentication.